I'll be posting a new poll in a few days. Spooky Text of the Day: Today's story is "Four Wooden Stakes" (1925) by Victor Roman. I think people can vote more than once, but only if they log in under different LJ names. It's limited to one vote per LJ. Weep not! There will be more polls, and perhaps your choice will win then! All is not lost! It looks like you voted for Dr. Evil from the Austin Powers films. Does that sound right? It does, sadly, so sadly. Oh wow. Now that would be fantastic! 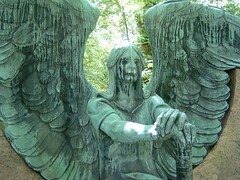 (BTW, feel free to use any of my cemetery photos if you like! Thanks so much! I would love to use some of them. It looks like the "blog this" option is disabled on your pictures - how does that work, then, to link to one? Should I download it and then re-upload it elsewhere, or something else? (Sorry for the troglodyte question! I just want to be sure I'd do it the way you'd like.) Thanks again! Oh, is it? I thought I had enabled that. I'll go change it. I may have it set to family only right now. OK, I just set it to allow any contact to blog. Let me know if that doesn't work! That is one formidable-looking apotropaic angel! It looks like he might be blind, like Uziel in The Prophecy. Ooooh! I'd forgotten about this film. I saw it in the theater, but it's hard to believe that was so many years ago. Nice (and creepy) comparison! Oh, foolish Claude Rains! Why must you meddle in things men should leave alone?